R&D Tax programs are government incentives that help encourage businesses of all sizes to conduct R&D that will lead to new or improved products or processes. In Canada, this program is known as Scientific Research & Experimental Development (SR&ED) and is the largest single source of government support for industry. Claimants can apply for SR&ED Investment Tax Credits (ITCs) for expenditures such as employee wages, contractor costs, materials, machinery, equipment, specific overheads, etc. To achieve a catalytic effect, the original R&D tax credit program was first introduced in 1944 at which time traditional tax measures such as the deduction and the tax credit were introduced. Over time, however, the tax measures were tested and found to be lacking in several key areas. Consequently, the program was fine-tuned in 1985 to facilitate use and improve the administration process which resulted in the present day Canadian Scientific Research & Experimental Development (SR&ED) program. As of 1995, further modifications were made to shift focus towards broadening and facilitating access to the SR&ED tax system by way of several incremental improvements. As of 2008, the Federal SR&ED program provided $5 Billion in ITCs to over 18,000+ claimants. All companies operating in Canada can secure ITCs provided they have eligible projects. The percentage of recovery, however, varies due to several factors including: corporate structure, taxable income, location of business, etc. For example, Canadian Controlled Private Corporations (CCPCs) are entitled to additional benefits such as greater recovery amounts, refundable credits, etc. 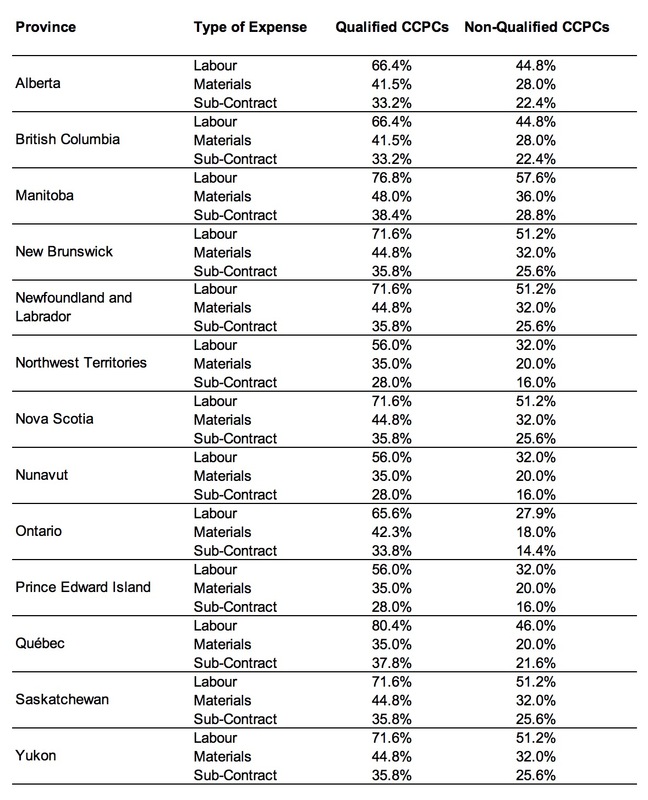 For a list of expenses and corresponding ITCs by province, please see the figure below. Experimental Development that is undertaken to achieve a technological advancement to create new or improved materials, devices, products, or processes. Applied Research that advances scientific knowledge with a specific practical application in mind. Basic Research that advances scientific knowledge without a specific practical application in mind. Support Work that is related to the following activities: engineering, design, operations research, mathematical analysis, computer programming, data collection, testing, or psychological research. To illustrate the benefits of SR&ED, we first examine Figure 1 below where ITCs yield an immediate benefit to a company. 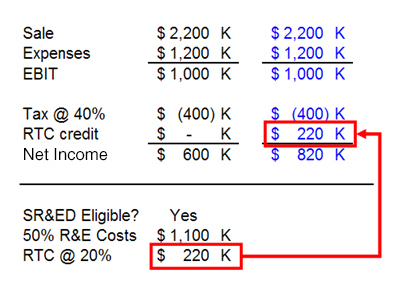 In this example, a given project provides Earnings Before Income Tax (EBIT) of $1,000 K which translates into Net Income of ~$600 K. However, if that project were SR&ED eligible, the tax burden reduces and provides an increased Net Income yield to ~$820 K instead. Thus, the company is able to increase its cash flow by ~$220K which permits the business to move forward in other areas in the coming year. Why does the Government run the SR&ED program?To answer this question, we take a macro-economic approach to observe the effect of this program. 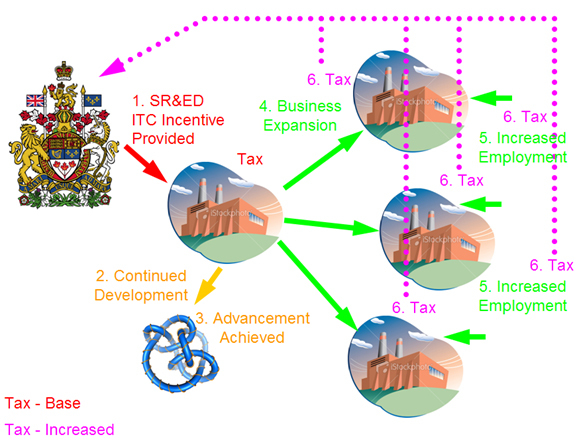 In basic terms, SR&ED acts as a catalyst to stimulate economic growth within Canada. As illustrated in the figure below, when the Government provides this incentive, a company is able to increase its funds to perform SR&ED work. When successful, a product is developed more quickly resulting in a technological advance for the country. Once the Research and Development (R&D) phase is complete, the company expands operations to launch its new product or process which ultimately results in an increase in employment, an increase in revenue, and an increase in the Country’s overall economic performance or Gross Domestic Product (GDP). Furthermore, the SR&ED incentive also provides the Government with significant Return on Investment (ROI) through increased Tax revenue from expanded operations and increased employment. Thus, the benefits are significant in aiding the Government to increase its own cash flow. We are committed to providing our customers with the greatest R&D Tax services for the greatest value in any market place. For this reason, we have developed a unique and highly competitive price matching guarantee policy. For a detailed illustration of the cost savings, please refer to the graph below. Contingency Pricing: National R&D will share in 100% of the risk with you by structuring our fees as a percentage of the final Investment Tax Credits (ITCs) awarded by Canada Revenue Agency (CRA). Although this option is commonly offered by our competitors, the fees are usually set in wide 5% increments (30%, 25%, 20%, etc.) 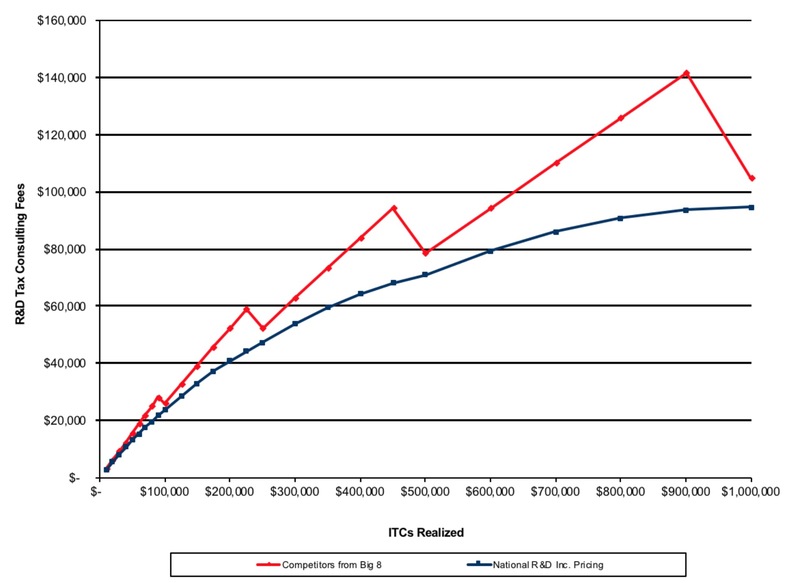 National R&D’s pricing is more granular to prevent over charging clients. For this reason, savings with us can range from a minimum of 10% and up to 34% over the competitor’s fees. Additional 2 Net 10 Savings is included. Upon approval from CRA of the SR&ED ITCs, we will discount an additional 2% on fees if payment is received within 30 days of Notice of Assessment or Re-assessment. No Administration Fees: We pro-actively wave the 5% administration fee normally charged by our competitors.